We have taken 40% off our De Hoop Village Cottages for Winter!! Excludes Event weekends. Please enquire when booking. Self-Catering Basis. No minimum night stay. Rate includes accommodation for up to 6 guests. Rate Excludes Reserve Entrance Fees (R50 pp) and any extras incurred. 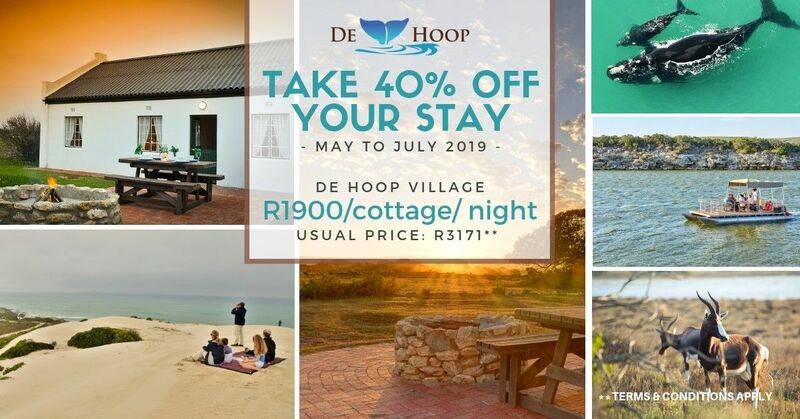 Valid for all new bookings made for De Hoop Village units only for stays from 1 May to 31 July 2019. De Hoop Village has 9 units. Each unit has a fully equipped kitchen, lounge, double bedroom, twin bedroom, bunk beds bedroom, bathroom with shower, outside braai (barbeque) area. Limited Availability. E&OE.